What are canker sores types, and what do they look like? Are canker sores the same thing as cold sores (fever blisters)? What are signs and symptoms of canker sores? What natural or home remedies cure canker sores? What topical prescription and over-the-counter (OTC) medications cure canker sores? 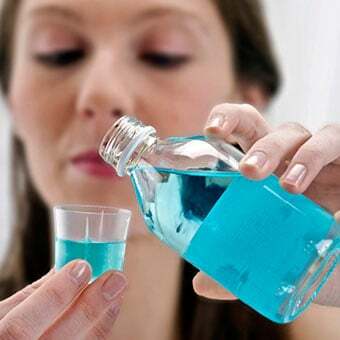 What mouthwash solutions be used to treat and cure canker sores? What oral medications are available to cure canker sores? What should a person do if they get recurrent or chronic canker sores? Dr. Balentine received his undergraduate degree from McDaniel College in Westminster, Maryland. He attended medical school at the Philadelphia College of Osteopathic Medicine graduating in1983. He completed his internship at St. Joseph's Hospital in Philadelphia and his Emergency Medicine residency at Lincoln Medical and Mental Health Center in the Bronx, where he served as chief resident. Canker sores (aphthous ulcers or aphthous stomatitis) are small, painful ulcers inside the mouth. They may occur on the tongue and on the inside linings of the cheeks, lips, and throat. They usually appear white, gray, or yellow in color, with a red border. Canker sores are among the most common types of oral lesions, affecting about 20% of people. Women get canker sores more often than men. Canker sore susceptibility may be inherited, and the condition can run in families. Minor sores measure from 3 to 10 millimeters (mm) and are the most common type of canker sore. Lesions last 10 to 14 days and heal without scarring. 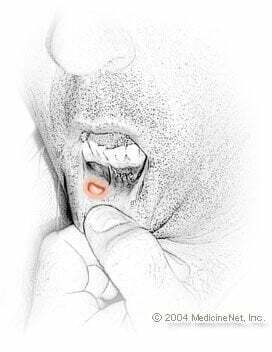 Major sores are larger and deeper than minor sores, have an irregular border and a diameter of greater than 10 mm. Major canker sores may take weeks to months to heal and can leave a scar after healing. Herpetiform sores are characterized by large groups of multiple sores. These are small ulcers (2-3 mm) but there may be as many as 100 ulcers present at the same time. They tend to heal without scarring. Injury to the mouth may cause simple canker sores. Injury could be from vigorous tooth brushing, dental work, braces or dentures, or a sports accident. Acidic foods, including citrus fruits, may trigger a canker sore or make it worse. No, canker sores are not the same thing as fever blisters (cold sores). Canker sores occur inside the mouth and are not contagious. Fever blisters are infections caused by the herpes simplex virus (HSV), they mostly occur on the lips and outside of the mouth, and they are very contagious. In most cases, canker sores do not require any treatment, and there is nothing specific you need to do to get rid of a canker sore because it usually will heal on its own. Home remedies can be used to help relieve pain and inflammation of canker sores. Topical medications applied directly on the sore, mouthwashes, and oral medications can relieve pain or inflammation. Allow ice chips to dissolve slowly in your moth for relief of pain. Avoid acidic foods such as citrus fruits or spicy foods that may aggravate the sore. If there is any vitamin deficiency (a doctor can test for this), take supplementation as prescribed. Brush teeth gently and use a brush with soft bristles. Use toothpaste and mouthwash that does not contain sodium lauryl sulfate. Another home remedy is to mix milk of magnesia with Benadryl liquid and use as a mouth rinse. You can also dab milk of magnesia directly onto the canker sore with a cotton swab. Rinse your mouth with a salt water or baking soda rinse. Mix 1 teaspoon of baking soda per ½ cup water, and rinse. Other natural remedies include goldenseal mouth rinse, deglycyrrhizinated licorice (DGL) gargled in warm water, and saltwater rinses. Zinc lozenges may help provide relief and speed healing time. Do not give lozenges to young children, as they may be a choking risk. Vitamin C, vitamin B complex, and lysine can be taken orally when lesions first appear and may help speed healing. Infuse sage and chamomile herbs in water and use as a mouthwash four to six times daily. Carrot, celery, and cantaloupe juices may also be helpful. Consult a health care professional before using any home remedy as many have not been scientifically tested or proven effective. Topical gels or ointments are used for canker sores to relieve pain, decrease inflammation, and prevent infection. Topical pain medications: Gels such as benzocaine (Orajel, Orabase) and lidocaine (an anesthetic) are used directly on the canker sore to relieve pain or discomfort. Canker sore patches (Canker Cover) provide pain relief while covering and protecting the sore as it heals. These types of medications can be found over the counter. 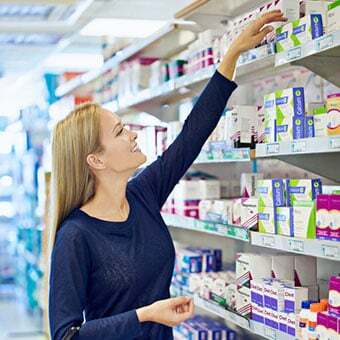 Topical anti-inflammatory medications: Steroid medications such as triamcinolone acetonide or fluocinonide can be used topically to decrease inflammation from canker sores. These medications usually require a prescription and should be used exactly as your doctor or other health care professional has instructed. Topical antibiotics: These medications may be prescribed by your doctor or dentist if there is a possibility of the canker sore becoming infected with bacteria. Redness, crusting, pus discharge, or fever are signs of infection. Diphenhydramine suspension (Benadryl Allergy liquid) is available over the counter and can be used as a mouth rinse because it has topical anesthetic effects on the tissue of the mouth and the canker sore. Put the suspension in your mouth, swish it around for 30 seconds to one minute, and spit it out. Do not swallow the rinse. Anti-inflammatory steroid mouth rinses may be prescribed to help reduce inflammation of the sores. Tetracycline antibiotic rinses may be prescribed and have been shown to relieve the pain and promote healing of canker sores. Do not use tetracycline if you are pregnant, people allergic to tetracycline, or if the person with the canker sore is a child under 16 years of age. Several oral medications may help relieve symptoms of canker sores. Over-the-counter pain medications such as ibuprofen (Advil), acetaminophen (Tylenol), or naproxen (Aleve) can be used to help with discomfort from canker sores. Zinc lozenges or vitamins B and C may also help relieve symptoms of canker sores. If a person suffers from frequent canker sores, there may be an underlying medical reason or illness that causes them. See a health care professional or dentist if there are any concerns that canker sores are frequent. Predisposition to canker sores may just be genetic. However, some diseases that affect the immune system such as lupus, Crohn's disease, celiac disease, or HIV/AIDS may cause frequent or recurrent canker sores. Health care professionals can order tests to determine if there is an underlying medical reason for a person's frequent canker sores. Femiano, F., Lanza, Alessandro, et al. "Guidelines for Diagnosis and Management of Aphthous and Stomatitis." The Pediatric Infectious Disease Journal 26 August 2007: 728-732. University of Maryland Medical Center. Goldenseal. University of Maryland Medical Center. Licorice. WebMD.com. Understanding Canker Sore Symptoms. Please describe what treatments have been effective for your canker sores. What were the symptoms of your canker sores? What topical medications have been effective treatments for your canker sores? Which medications have you tried for pain or to treat your canker sores? What would you recommend? Please describe your experience with canker sores. People who have braces or retainers must take special care when cleaning their teeth. They must floss and brush regularly and avoid eating hard and chewy foods. It's important to wear a mouth guard when playing sports to avoid dental injuries. Celiac disease is a condition in which a person has inflammation of the small intestinal mucosa when exposed to gluten in the diet. Symptoms of celiac disease include bloating, nausea, diarrhea, and abdominal discomfort. Treatment is a gluten free diet. Some individuals may have refractory celiac disease in which they do not respond to a gluten free diet. Cold sores and canker sores aren't the same. 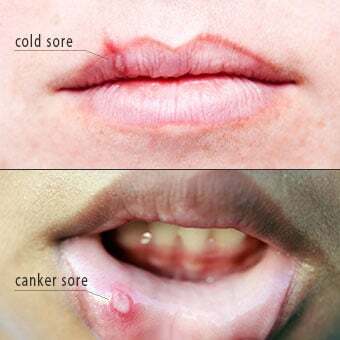 See a picture of Cold Sore and Canker Sore and learn more about the health topic. How to get rid of cold sores? First learn about the herpes virus and how it causes cold sores. When are cold sores contagious? Get information on triggers that can cause a flare up in cold sore symptoms. Crohn's disease is a chronic inflammatory disease, primarily involving the small and large intestine, but which can affect other parts of the digestive system as well. Abdominal pain, diarrhea, vomiting, fever, and weight loss are common symptoms. Dentures, removable replacements for missing teeth, come in two types: partial and complete dentures. Dental implants and bridges are suitable alternatives to dentures. Though it usually takes a while to get used to eating and speaking with new dentures, denture adhesives can improve the stability of the denture and provide a sense of security for the denture wearer. Gum problems may be caused by improper brushing and flossing, gum disease, canker sores, treatments and hormonal changes. Symptoms of gum problems include red, swollen, sore and bleeding gums. These symptoms can be prevented by brushing twice a day, flossing daily, eating a well-balanced diet, drinking enough water, not smoking, and relaxing. Dentists use lasers to remove tooth decay, treat gum disease, biopsy tissue, and whiten teeth. Oftentimes, lasers cause less pain than traditional dental work, plus, they minimize bleeding and swelling. Unfortunately, lasers can't be used on teeth that already have fillings. Learn about some of the most common problems in your mouth such as sores, oral cancer, TMJ, painful gums, bad breath and more.